We received news from our friends at the American and Old Timey Music Club in Western Australia about some stolen instruments. One of their members Greg had his house burgled and, among other things, they took his two prized banjos. So if you are out looking for a banjo, in WA or interstate please check the following. The first one is a White Swallow banjo which, unfortunately, there is no picture of but, is a standard model with a dark brown neck and resonator, ebony fingerboard and black headstock with metal and an inlayed White Swallow emblem. The serial number is WS 512109834. The next banjo (pictured above) is highly personalised. 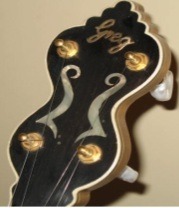 This banjo was completely made by Greg right down to his name on the peg head. Apart from the name at the top, Greg also put in some distinctive inlay on the finger board, including a mother-of-pearl molar. Greg the owner is a dentist.